Dawn Mathews had always wanted to milk a goat. One day, she finally got her chance. Though she thought it was “the coolest thing in the world,” she had no idea it would change her life forever. It was 2009, at the peak of the recession. Mathews’ husband had recently lost his full-time job, and her family of four was “making ends meet” on his part-time gigs. 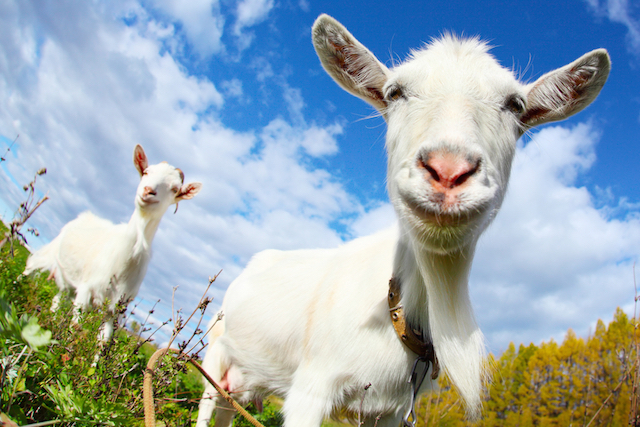 Keep reading to learn the story of a family, their goats and the home business they grew out of a disaster. The cost of cow’s milk had risen to $4 a gallon, and with 9- and 7-year-old sons at home, she thought a goat might be the solution. She told her husband she wanted to get a goat so they could drink its milk and also make cheese. The only problem? They lived in a subdivision in Granite Falls, North Carolina, on half an acre. But Mathews knew what she wanted — and forged forward, undeterred by their limited yard space. She told her friend she wanted to buy one of his goats, and they struck up a unique deal: a month of tae-kwon-do lessons from her husband (one of his odd jobs) as payment. Soon, they welcomed Buttercup to the family — but goats are herd animals, and she needed a companion. So Mathews turned to Craigslist and found a great price on a saanen goat: $125. Today, they usually cost $300 to $350, Mathews says. Buttercup’s new friend Athena quickly became the main milker, giving the family a gallon of milk a day. Two weeks after getting Athena, disaster struck: The goats got into the laurel bushes. Laurels are toxic to goats, and the treatment renders their milk undrinkable for two weeks. Mathews had to keep milking the goats, and lamented over the wastefulness of it all… Until a friend suggested she make soap. Emboldened by her success, she invested in her newfound business, spending $250 on soap-making supplies like lard, fragrance oils and lye. A few months later, she got a booth at a holiday fair and earned more than $1,000. That was the beginning of The Thankful Goat. Mathews continued to sell at festivals and farmers markets, and eventually expanded her line to include lotions, chapsticks, sugar scrubs and other products. By her third year in business, Mathews was working about 20 hours per week — and grossing $15,000 a year. She declined to share current sales figures, but she’s still only working part time. As for overhead, she spends about $100-$150 a month for the goats’ feed, supplies and medical care. Other expenses include soap-making supplies, marketing and web maintenance. Her now-teenage sons help with the family business, too; Isaac’s in charge of milking, while Dorian assists with sales. As payment, they get to sell the year’s baby goats and keep the profits. “It’s been not really just an entrepreneurial journey for us, but for the whole family,” Mathews explains. She also gets farm help from volunteers with the WWOOF (World Wide Opportunities on Organic Farms) program. Not only has The Thankful Goat changed her family’s lifestyle and finances, it’s also changed Mathews herself. “I’m OK standing in the kitchen and making product, because I know it’s going to put food on my family’s table,” she adds. This year, Mathews and her family moved to a 13.5-acre farm. They have nine goats, a llama and dreams of starting an agritourism operation. And it all started with a single goat. Your Turn: Would you open a business like this?